See also: Progressive Farmer; Subtreasury Plan. The Farmers' Alliance, formally known as the North Carolina State Farmers' Alliance and Industrial Union, was a large and influential organization of farmers and rural citizens that was founded in Texas and spread across the South and Middle West in the late 1880s. Its representatives first appeared in North Carolina in 1887; by 1891 more than 100,000 North Carolinians had joined. This spectacular growth resulted from several factors. Most important, the increasing commercialization of agriculture thrust various classes of the state's farmers into a complex and often-hostile web of trade relationships. Many North Carolina farmers relied on local merchants for credit, materials, and crop marketing. The monopoly of the local merchant resulted in high credit rates and high prices for goods purchased on credit. Market prices for agricultural products were often depressed by harvesttime gluts. Further, loans from the merchant were protected through the crop lien, a legal device that gave the merchant priority rights to crops to satisfy debts. Farmers were also harmed by government policy, including the federal government's protective tariff on purchased goods. The Farmers' Alliance was a "secret," all-white organization. It permitted men and women farmers, rural mechanics, teachers, preachers, and physicians to join; it expressly excluded lawyers and merchants. The occupational admissions test revealed a Republican-inspired faith in rule by agricultural producers. The North Carolina Alliance included more landowners than tenants or laborers. In fact, leadership tended to be delegated to wealthier planters, as indicated by the high status of the order's two presidents between 1887 and 1891, Sydenham Alexander of Mecklenburg County and Elias Carr of Edgecombe County. I n 1890 the Farmers' Alliance was strong enough to make political demands that would receive a full hearing in the Democratic Party. Most Alliance members, and particularly most Alliance leaders, were Democrats. The two issues of greatest contention in 1890 were the Alliance's Subtreasury Plan and its demand for a state railroad commission. Given the increasingly obvious inability of the order's cooperative devices to thwart the existing credit and marketing system, the Farmers' Alliance proposed that the national government construct warehouses, or subtreasuries, and issue negotiable notes on crops deposited in the warehouses. Combined with the Alliance's more general plan to increase money volume and have all money issued by the federal government, the warehouses would raise the prices for goods received by farmers and reduce the credit and marketing power of merchants. The Subtreasury Plan was strongly supported by the North Carolina Farmers' Alliance, and considerable pressure was placed on the state's congressional delegation to support the proposal. The state railroad commission idea, which had been defeated in the 1889 General Assembly, was promoted in order to eliminate high intrastate freight rates and low taxation of railroad property. Political activity by the Farmers' Alliance resulted in the election of a General Assembly dominated by members of the organization. One source estimated that 110 of the 170 representatives in the 1891 assembly belonged to the order. After early 1891, controversy about the future of the Farmers' Alliance escalated. Division within the North Carolina order developed on such fundamental issues as the Subtreasury Plan, which perhaps one-third of the membership opposed, and a new demand, adopted by the national organization in early 1892, for federal government ownership of railroads. The latter proposal was criticized by many members, including a former president of the North Carolina Alliance, Elias Carr, who favored public regulation instead of ownership. These disagreements were related to increasing rancor within the Farmers' Alliance about the appropriate political posture of the organization. In particular, members were divided over the duty of the order in national politics. In the summer of 1892 conflict over this issue climaxed, leaving the organization permanently shattered. The formation of Populist parties in other states contributed to the decline. But more significant were the Democrats' nomination of Grover Cleveland in July for president and the growing opposition by some North Carolina Democrats to the influence of the Farmers' Alliance influence within their party. After 1892 the close connection between Populist and Farmers' Alliance leadership increasingly alienated Democrats from the Alliance. Although the Alliance continued to hold annual meetings in North Carolina through the 1890s, and remnants of the organization persisted until 1941, the order never recovered from the political and ideological battles of 1892. The national Farmers' Alliance organization ceased to exist after 1897. Alan B. Bromberg, "'The Worst Muddle Ever Seen in N.C. Politics': The Farmers' Alliance, the Subtreasury, and Zeb Vance," NCHR 56 (January 1979). John D. Hicks, The Populist Revolt: A History of the Farmers' Alliance and the People's Party (1931). 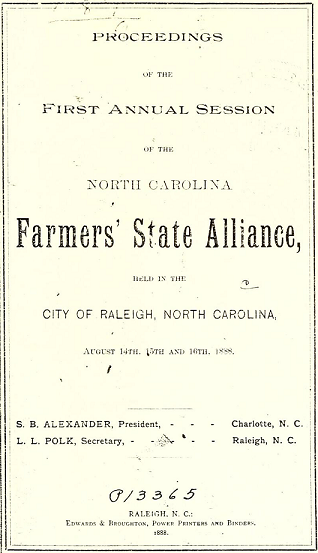 Proceedings of the Farmers' State Alliance of North Carolina at Archive.org. Proceedings of the First Annual Session of the North Carolina Farmers' State Alliance. Raleigh, N.C.:Edwards & Broughton, 1888. http://archive.org/details/proceedingsofnor1888farm. 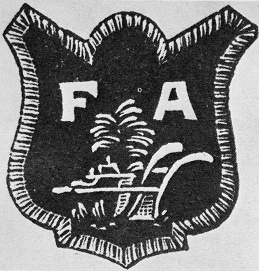 Drawing of a Farmers' Alliance badge. Call no. N_85_3_20. Courtesy of the State Archives of North Carolina.